On a future Earth, where invading aliens have forced humanity to revert to a feudal society and conducting scientific research is punishable by death, it's good to be the heir to a duchy. Unless your brother has been burnt as punishment for heresy. And unless you intended to do something about it. 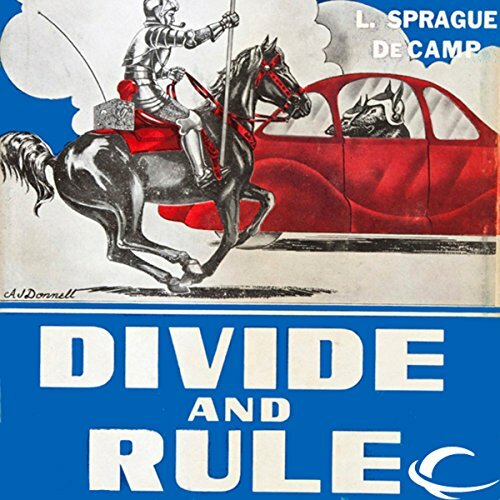 ©1939 Street and Smith Publications, Inc.; © 1948 L. Sprague de Camp (P)2012 Audible, Inc.
What did you love best about Divide and Rule? it's quirkiness. About America adapts to being ruled by aliens. Updated some of the outdated, not very PC attitudes regarding women. What about Mike Chamberlain’s performance did you like? Nothing in particular stands out. It was more of a silly book than a "moving" book. This is a story I read many years ago and wished I'd kept a copy of because it is so ... silly and simple.